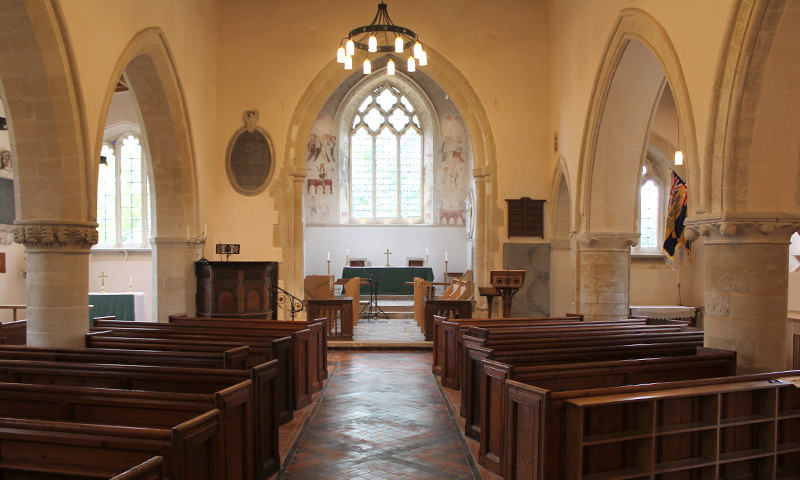 The church and community of Chalgrove were closely connected with Wallingford from Saxon times until 1317. When the Norman castle of Wallingford was built its chapel was linked to three churches, of which Chalgrove was one, forming the Prebend. The priests were royal clerks, appointed by the king, whose patronage would explain the unusually fine architecture of St Mary’s and the high quality of its lavish wall paintings. The nave dates from around 1150 and is the earliest part of this building. It was almost certainly built, following the anarchy, by Peter Boterel, Keeper of Wallingford Castle, whose chief seat was Chalgrove. The chapel forming the south aisle was added in c.1190 at around the same time that the lower section of the tower was built. 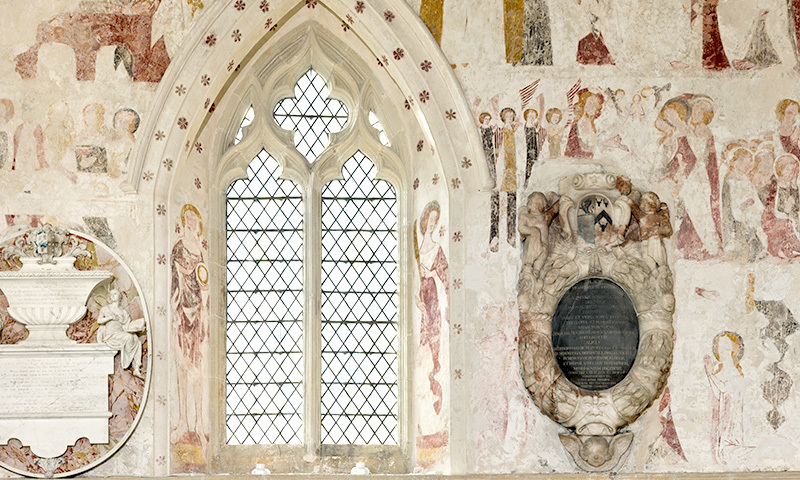 In c.1250 a north aisle was added and this was extended to both the north and the east in c.1450 to create a Chantry Chapel, on the east wall of which there is a contemporary wall painting. Further building on the tower raised it to its present height, the south porch was constructed, crenellation was added to the south side of the nave and the windows were replaced. The exceptional architecture of the chancel, of Florentine influence, and its fine set of medieval wall paintings may be explained by the appointment of Bonacursum de Frystobaldis as rector in c.1310. Frystobaldis was from a Florentine family of bankers, builders, and decorators, travelling throughout Europe, often commissioned by the king. The piscina and credence and the triple sedilia, all under cusped ogee arches, are of special note. The moulding of the triple sedilia is comparable only with that at Westminster Abbey, which is of wood, and that at Southwell Minster. A rare double squint, built into the north side allowed lepers and others, to see the Elevation of the Host at the mass through one hole and also the wall painting of the Last Judgement through the second hole. In 1317 Edward II granted the living of Chalgrove to Thame Abbey. Chalgrove’s close connection with royalty had ended but, for a while, the wealthy lords of the divided manor continued to support the church, as shown above by the c.1450 extensions. Possibly in 1536 but certainly by 1547 the wall paintings had been lime-washed over, and in 1542 Henry VIII gave the patronage of the church to his new Cathedral in Oxford (Christ Church). Much restoration was undertaken in c.1660, a necessity probably due to damage and destruction during the Civil War, the outcome of the Battle of Chalgrove adding further incitement. The font, consisting of two different types of stone, is thought to have been installed at around this time. The top is probably of Norman origin, as suggested by the decoration just below the rim. The motifs beneath, emblems linked to the Suffolk family, suggest that it may have come from their ‘palace’ at Swincombe, nothing of which apparently remains. It may therefore be an item of lost heritage. 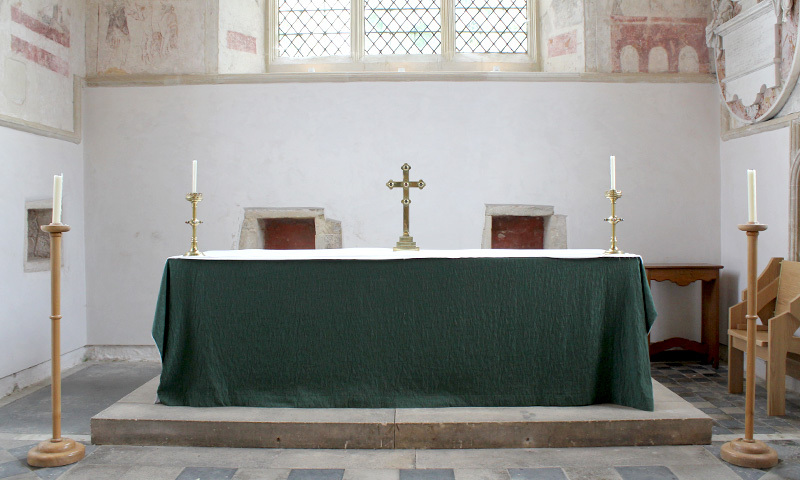 The pulpit is made up of panels of which there are matching ones at Stonor Park that are known to have come from the demolished Carlton house at Brightwell. The ring of six bells consists of four bells dated 1664 and the tenor and the fifth that were recast in 1729 following damage due to the partial collapse of the tower in 1726. Three of the bells are maidens – pitch perfect as cast (requiring no tonal modification). The one handed parish clock, one of the oldest working turret clocks in Oxfordshire, was installed as a thirty-hour clock in 1699. The figures of 1 8 6 3 on the face are the date of its modification to an eight-day movement. It is one of the few clocks in the country, in their original locations, that retain their original hand-wound form. Among many memorials in the church the Barentin family, lords of the shared manor for seven generations in Chalgrove are commemorated by brasses in the floor of the chancel. The last earl of Buckingham is honoured beside the altar. There are other monuments on the walls, and on the west wall of the nave a unique painted memorial commemorates the Quatermain family. Another unusual monument, on the north wall, honours members of the Winchcombe family. Hanging in the nave the Friendly Society banner, one of only a few that have survived, is the emblem of the local Society that provided a form of insurance before the National Health Service was introduced.